Poinsettia loomed flowers, with their dramatic red leaves, make an especially pretty display at Christmas. 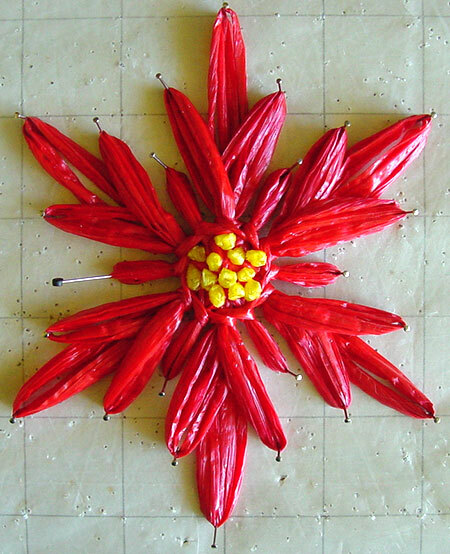 To make a poinsettia flower you will need any loom with three rounds of pegs. I have used a Studio Twelve Magni-Fleur loom for this tutorial. 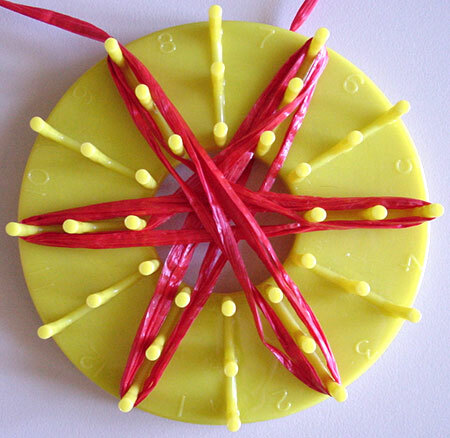 You will also need red Swistraw or ribbon straw and yellow yarn or ribbon straw. If you’re going to use your flowers for embroidery and not as free-standing flowers you can use any yarn of your choice. For yarns thinner than worsted weight, wrap each “petal” more than twice. I’m going to call the red leaves “petals” throughout the tutorial because it’s easier to follow. You will need to know how to wind your loom, stitch a back stitch centre, a stem stitch centre and work french knots or loop stitches for the centre. 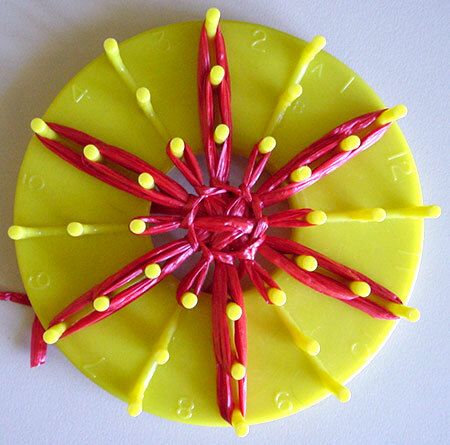 Begin by winding every second peg twice on the largest round. Wind each petal twice before moving onto the next petal (known as the flat wrap technique). 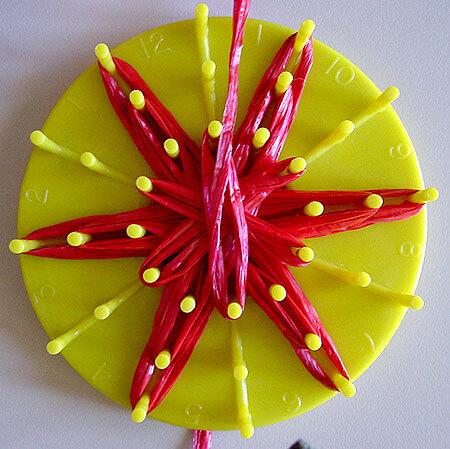 Wind the same pegs on the medium round four times. Wind every second peg on the smallest round twice. Make sure these are not the pegs you wound on the previous rounds as you want the smallest petals to fall in between the large ones. Work a backstitch centre with the same colour as you used to make your petals, then cover it with stem stitch to form a nice bold centre. Remove your flower from the loom and stitch the loose ends into the back. Fill the centre with yellow french knots or loop stitch. 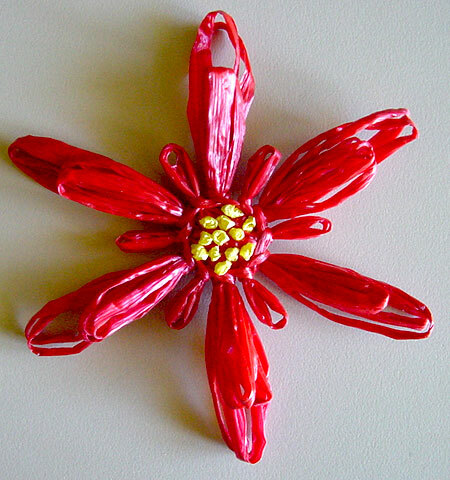 If you are using your flower for embroidery you can skip this step and shape it as you stitch. 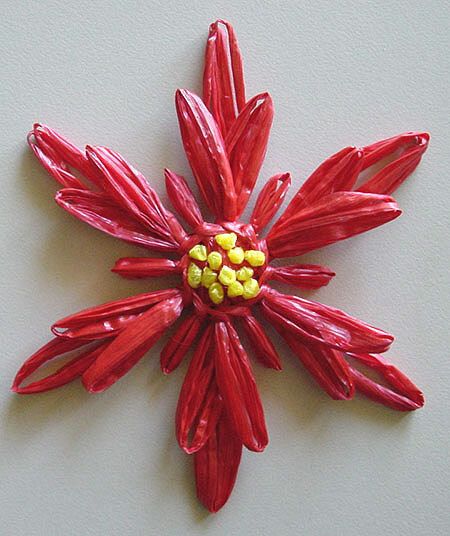 However, if you want to create a free-standing flower you will need to pin it into shape and spray lightly with water. 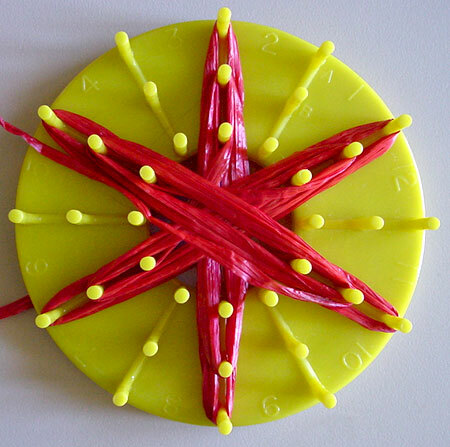 Separate the medium petals so that two loops sit on each side of the large petals. Leave it pinned in shape until completely dry.